Soft speaking and whispering. The crackle of a wood fire. Fingers tapping on a keyboard. The crinkle of turning pages. Bob Ross cooing about happy little trees, accompanied by the ch-ch-ch of his brush on a canvas. Do any of these sounds, or even thinking about these sounds, give you a tingle across your scalp, down your neck and along your extremities? If yes, then you, as am I, are susceptible to ASMR. That’s Autonomous Sensory Meridian Response, for those who haven’t discovered the burgeoning subculture of ASMR audio, video, radio, and who knows what else. I’ve felt ASMR all my life without knowing it was, as they say, “a thing,” or that others reacted to the same triggers as I did. I came across the ASMR subculture only a few weeks ago, while seeking further information on “Lonely at the Top,” a track off of Holly Herndon‘s recent “Platform” album. As you can hear by clicking on its title, “Lonely at the Top” presents the soft, intimate voice of a woman welcoming a client to an appointment for a massage, and for whatever else your perfervid imagination may picture, while in the background, crinkling paper, fingers tapping on a keyboard, pouring water and other quotidian sounds add to the atmosphere. Turns out that the voice belongs to one Claire Tolan, an ASMR sound artist and radio host, and that this track was meant, in a small way, to do for ASMR what Mozart’s “The Magic Flute” did for Freemasonry: introduce a hidden subculture to outsiders. But don’t get the wrong idea about ASMR from “Lonely at the Top.” ASMR is not meant as a turn-on. Indeed, most of us tingle junkies go for a fix not when we need arousal, but when we need to be calmed down. To erase the cares of the day and aid relaxation and sleep, there’s nothing better. OK then, “Lonely at the Top” aside, what other musical sounds trigger my tingles? Most of my musical triggers involve the intimate contact of natural elements: Fingers on strings. Soft mallets on wood or metal. The brushwork jazz drummers perform when they “lay a carpet” behind a slow ballad. The celeste on Chet Baker’s early vocal recordings. Harpo’s solos in the Marx Brothers movies. A master of the balafon. Guitarist Joe Pass, up close and personal. Or they could be warm, intimate vocals, the kind that feel as if they were whispered right into your ear: A great mezzo singing “Premiers transports” in Hector Berlioz’s “Roméo et Juliette.” The Fleetwoods a cappella. Something off Grouper’s last album. Just compiling this list makes me all tingly. Why do these sounds trigger my ASMR and not others? According to the limited research on the subject, one not fully embraced by the scientific or medical communities, all of us in the ASMR camp have our unique trigger set, though some stimuli are fairly consistent. Many of mine are typical. But one thing that many of my triggers have in common is the audible and/or visual sensation of a craftsperson focusing intensely on his/her work. 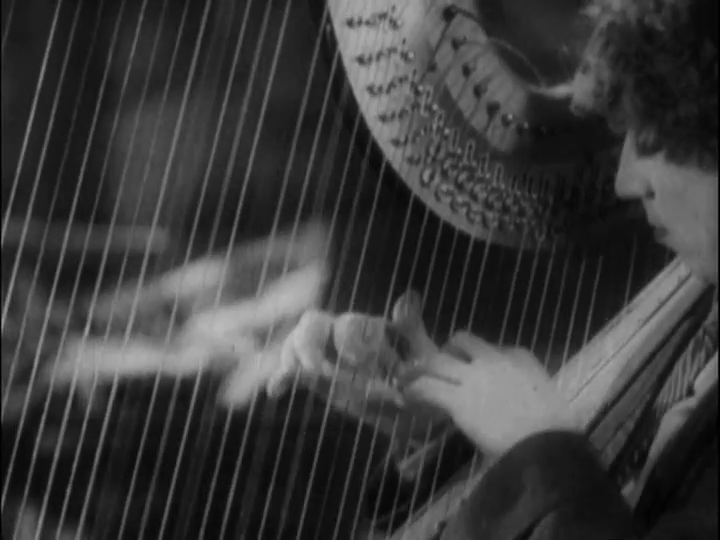 Consider, from the above lists, Harpo Marx’s harp solos in the Marx Brothers comedies. Vestiges from the Marx’s vaudeville routines, the harp solos have struck some viewers and (especially) critics as hokey intrusions into the films’ anarchic scenarios. And Harpo’s technique, while deft, was distinctly homemade. But these scenes always get to me, in no small part because of the look of rapt concentration that emanates from the great clown’s face as he gently strokes his strings. The effect is magical. Perhaps this feeling goes some way to describing my lifelong “musicophilia,” to borrow Oliver Saks’s term. For both beauty of sound and focused mastery, what can beat music? If you have some favorite musical AMSR triggers, please share. We’re always on the lookout for new ones.